The Ware for October 2018 is shown below. Thanks to Michael Dwyer for submitting this ware! This entry was posted on Wednesday, October 31st, 2018 at 2:10 am and is filed under name that ware. You can follow any responses to this entry through the RSS 2.0 feed. You can leave a response, or trackback from your own site. You stick it in the front windshield, and as you drive through the toll booth, the buzzer beeps to let you know that the system said it successfully debited the appropriate amount of the toll from your account. Indeed. 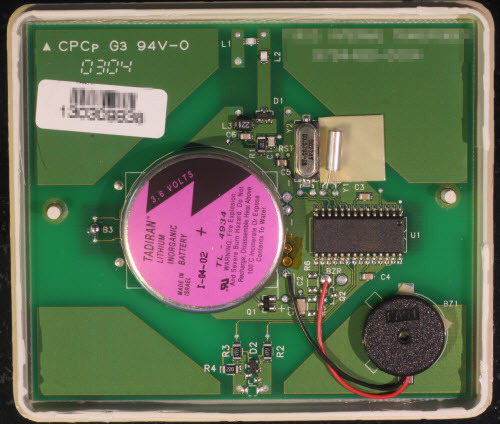 Looks like the transponder board used by the FasTrak toll system. Seems to also match the externally accessible battery slot on the opposite side. Yup, same guess. I’ve pulled apart one of those not too long ago…looks similar. Barry, indeed a toll tag. These have long battery lives, explaining the Lithium primary cell, and a beeper to signal transaction status (in an incomprehensible way). Lets see, it has a RTC crystal in addition to the normal one, large battery backup, but also a switch, LED and buzzer. But it appears to have an attenna in the board. There is also a surface connector near the middle on the bottom. I don’t think it is a Tolling RFID, but it appears it would SEND a chirp when the button was pressed, so it might be some kind of a transponder, like a big industrial garage door opener with security (hence the RTC) or similar remote. Looks like a FasTrak toll tag to me! As everyone else is saying, it is definitely a radio toll transponder. Or should I say two of them. The boards do not appear to match perfectly, so I am guessing that one of those is an old transponder and the other is a new one. 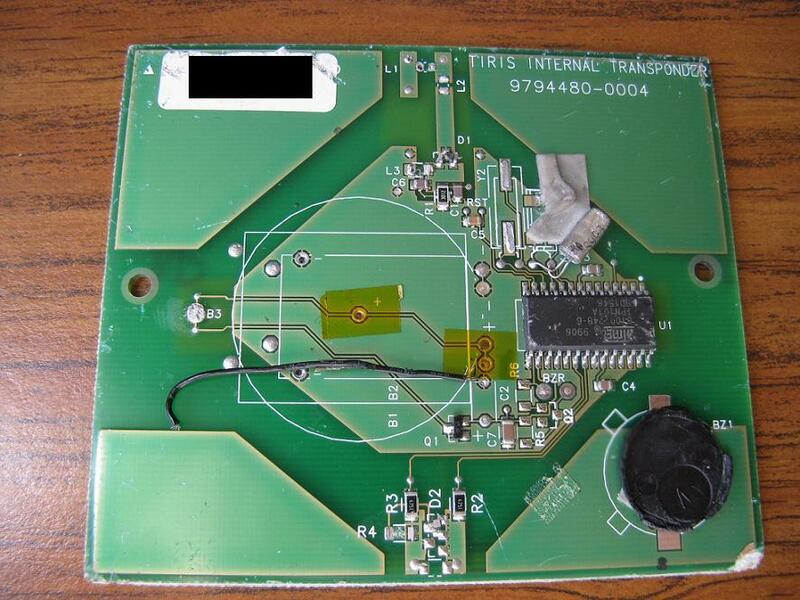 They are Texas Instruments RFID Systems (TIRIS) internal transponders. The first image is the newer one, and the second is the older, if my google-fu is working correctly. Maybe one of these years I’ll get here early enough. Yup. 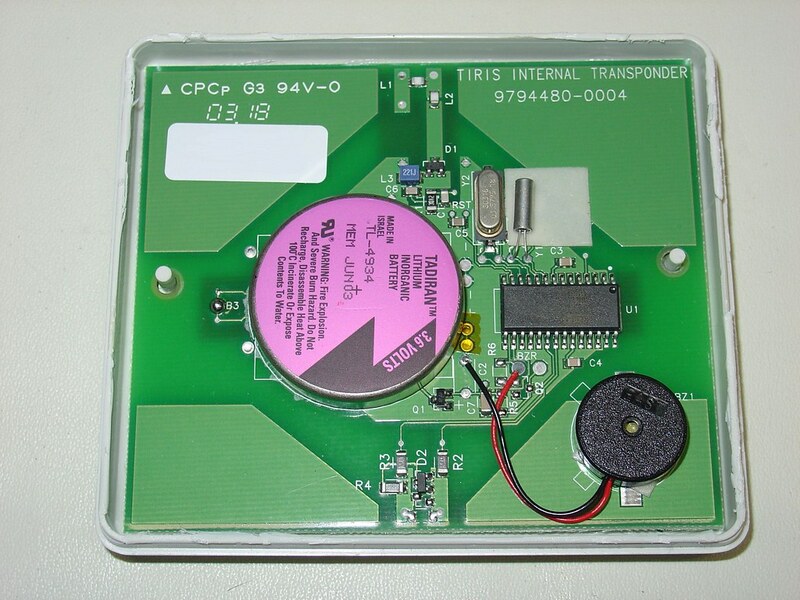 A FastTrak transponder. Almost exactly like mine. I’m going to guess something like an EZTRAK transponder. but the toll tag evidence above is pretty convincing. I am familiar with the EZpass transponders used here in the eastern US, which are silent AFAIK. What’s the piezo buzzer used for? And the push button, is it a reset? It beeps when there’s a transaction. DNK about the button. May be an alarm clock that has back lighting? 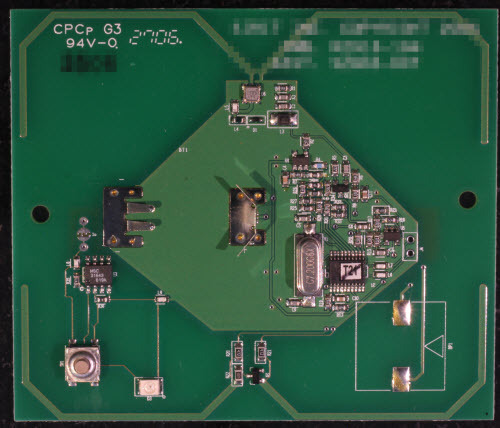 The first circuit board has an Atmel MCU with 2 crystals connected 2 it, one fast, another one likely the 32kHz version. It might also be a timer, given the single reset button at the second PCB. If it’s a timer then may be it is being used for measuring the time some goods, food products, travel at logistics system. The timer might be placed to the crate, with the transportable goods. Those are just wild guesses, I really do not know. Sheesh, you smart guys really over-think things. Look, the circuitboard is green, just like the one inside my toaster. And it has CPCp printed on it – that’s because I call my toaster a Crappy Piece of Crap when it burns the toast. And that round pink thing must be where the bread goes; it says it right there – in organic. So the organic goes in there and I guess the toast must come out of the black thing, which totally makes sense because it’s just as black as the Crappy Piece of Crap makes my toast. And you guys are supposed to be smart. It’s a toaster! It’s the same shape and everything…. I’m disqualified since I did a whole talk about these. The interesting thing about the antenna is that it works purely by reflection. The toll plaza sends a carrier wave and the microcontroller changes polarization of the RFID pads in order to transmit a signal back. This makes the transponder very efficient since it doesn’t have to power an amplifier to transmit. Hey Bunnie, the cert on bunniefoo is expired. Might want to check that out! Helps to install the certificates correctly. Should be fixed now, thanks. So, as most of you had guessed, these are two different RFID transponders used for automated vehicle tolling. These particular ones were used with Colorado’s ExpressToll system, but identical transponders have been used all over the country, if not the world. I think they’re sort of educational because of the changes you can see between the two versions. The first version had a built-in battery and a beeper, and some toll readers could be configured to command the transponder to beep. The later version removed the beeper and replaced the permanent battery with a removable battery, and added a battery test button, that would light the nearby LED. The newer one appears to have a greater number of parts, but I suspect still comes out cheaper. The antenna configuration changed dramatically, too. But my favorite part is blurred out in the photos. The early Atmel-based device was branded TIRIS (Texas Instruments Registration and Identification System). For the newer model, the company reversed the name to SIRIT, which appears to be a private company in Toronto, now. Of course, modern RFID Automatic Vehicle Identification tags are just thin stickers, now, with no batteries required.